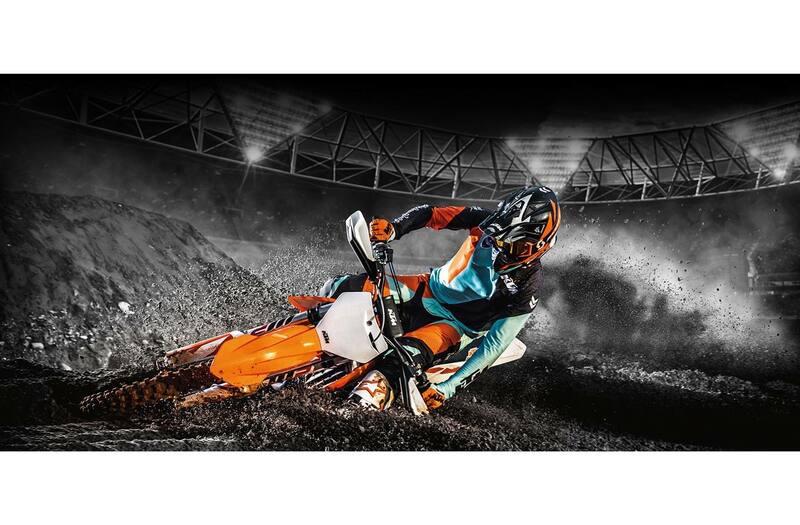 Power Supremacy: The championship winning KTM 450 SX-F is a proven formula that is the industry benchmark. For 2019, this new machine takes the next step in efficient performance and easy handling. It is fitted with a newly designed, extremely compact, single overhead camshaft cylinder head, as well as the latest electronic fuel injection. Pushing out an unrivalled 63hp in the most effective way possible, this 450 cc is the fastest Motocross bike KTM has ever built. Cylinder head: Inside the SOHC cylinder head, an overhead camshaft controls four ultra-lightweight titanium valves via extremely rigid rocker arms, which are DLC-coated on the intake side. A configuration like this allows engine speeds of up to 11,500rpm; a baffling figure for a large displacement thumper. New lateral brackets, made of aluminum instead of steel, allow an efficient fixation of the engine to the frame and contribute to the bike's featherweight feel. Crankshaft: The 450 SX-F's crankshaft utilizes a short connecting rod, which makes for an overall compact and lightweight engine with a snappy power delivery. A plain big-end bearing with two force-fitted bearing shells runs directly on the crank pin. The necessary oil feed for this bearing is ensured by the engine's pressurized lubrication. This design is a decisive benefit in terms of the crankshaft service interval, which can be lengthened due to the plain bearing. So just pin it, all day long. Crankcases and engine covers: The design of the die-cast engine cases allows for minimal weight and a very centralized shaft configuration. This makes the engine short and compact, while contributing to an efficient centralization of masses. The engine covers also feature a solid surface structure, which reduces the wear caused by the rider's boots. This way, your SX-F will keep looking better longer. Engine management system: The state-of-the-art Keihin Engine Management System with electronic fuel injection features a 44mm throttle body. Thanks to its unique injector position, the engine's response is instantaneous. And to make life even easier, separate systems for cold starts and idle adjustment await you. The lightweight ECU features a unique traction and launch control system for lightning-quick response when the gate drops and maximum grip thanks to different maps that sync with to the gear you're in. It's also possible to unleash an even more powerful mapping via the handlebar map switch. 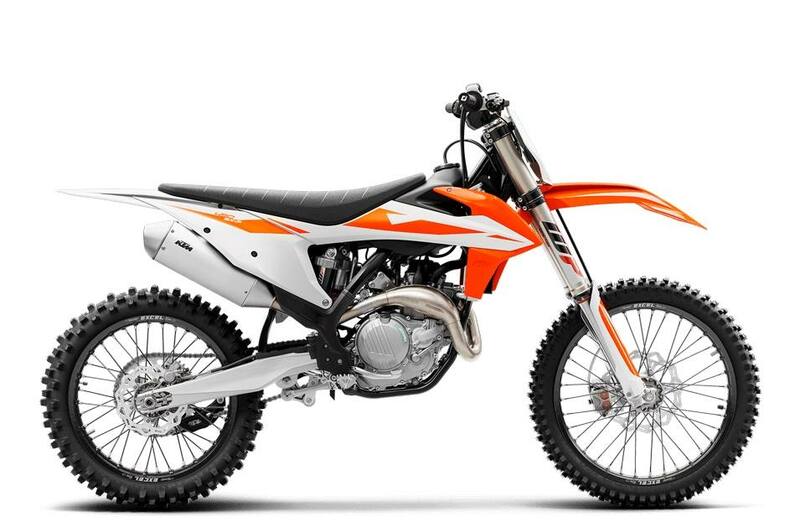 E-Starter: Like all KTM 4-stroke motorcycles, the 450 SX-F is started at the push of a button - a priceless advantage when you're on the clock. Exhaust: Competition noise limits are a real challenge for every manufacturer. Therefore, KTM has put a lot of effort into the development of their exhaust systems. All 4-strokes are fitted with headers that have a unique standard feature; an additional resonator system - a small chamber connected to the pipe. All 4-strokes are fitted with a short silencer, mounted as close to the engine as possible. You know what that means: extra mass centralization and better rideability. Its advanced internal design reduces the noise sufficiently in order to sit safely below the noise limit, while still raising the hairs on your neck.